I really like the look of this one and wondered if anyone had any opinions or experience with this model or alternatives. I've brought a Sachtler fluid head tripod and do love it but its absolutely massive and heavy. This monopod looks like it could be useful for a lot of effects and if ever the fluid head starts to disappoint for steadier slower pans i can switch to the Sachtler. I have a cheap $50 monopod and lightweight head. I never use the head. The set up works great and is super fast and stable to setup and use. I'm a believe in investing in good tripods, Vinten or Sachtler, but not so much with the mono. I only use up to 200mm, maybe if you're doing sports you need a better one. Although, if the 561BHDV comes with that blonde, I'd probably go ahead and get it. Second cheapest Weifeng model as I know. Do not use it much. But like extra cheap plastic head with handle for it's weight and you can really improve results with tele lenses. That video shows some great monopod techniques. Sure you can rotate the monopod to pan, but a good fluid head is key in tilting. I use the heavy duty manfrotto monopod along with a ball head coupler so I can use any 75mm ball head. Works just like the $300 561BHDV-1 in the video but far cheaper... much quicker to use than a tripod, perfect for run and gun. The Manfrotto 561 BHDV-1 is a very good video monopod, value for money. Go for it! You might also want to consider the 562B-1 if you already have a small video head lying around, like a Manfrotto 501,701 or something. 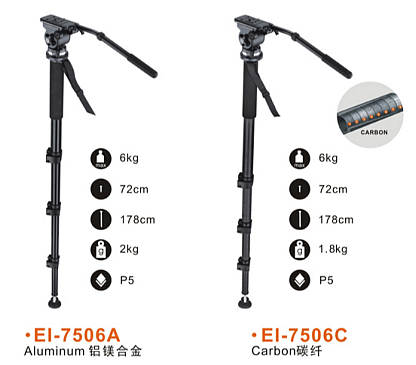 It's much cheaper and it's the same monopod except for the modified Manfrotto 701 on the 561 BHDV-1. Just swap out the video head. I have the Manfrotto - got the one with the plate as I already have a 701. I absolutely love it, I wish it would collapse just a bit lower though. that really looks interesting, what ball head coupler do you use? @shrigg what is that little cage you have around your GH2? It's the Shrigg Jig production cage that I designed a few months ago. Now they are being manufactured and sold here in the USA for $99. @ Shrigg, hey man that's cool a heck! I like the top hot shoe locking aspect of the cage. I like the size and love the price. I don't have my GH2 yet, been using but when I do i'm gonna order one of your cages. I love supporting small businesses so that's an added plus for me. I didn't like the head, so I bought the manfrotto 562. I took off the manfrotto plate and put a wf717 instead and add the manfrotto plate on the top of my head so I can still move my gh2 quickly from my rig to my monopod. Weifeng solutions use 717 head. So is Manfrotto the only one with the feet? I believe the one i linked is one of the few to have feet, but more importantly I believe that the fluid head atop the monopod is different to what you'd expect. The panning action is locked in the head, rather its built into the base element of the monopod.. as such you're meant to not get excessive undesirable twisting that you would get with a traditional head on top of a monopod. This design seemed to me to be quite neat, and unique. Do other monopods offer this? I think the 3 small feet on the Manfrotto 561BHDV makes a big different. Maybe this would do the trick on a budget: pan/tilt-head, 178cm with a footstep bracket to keep it from rocking if necessary. If the head comes off you could replace it with a 717. Anyone who's tried this kind of bracket technique? Thanks @oscillian, I tried ordering the manfrotto model but there is no stock in the UK at the moment. Their factories are off for the summer apparently!!! Here's a simpler setup using just a 503HDV head atop my Manfrotto monopod. @shrigg do you experience any problems with twisting with the panning head at the top of the monopod? The manfrotto one I originally linked to has the panning done at the base of the monopod, arguing that it removes problems of twisting when that motion is performed at the top. Having never tried it, i'm taking their word on it being a problem worth solving. I found the rotating cartridge at the base of the Manfrotto monopod to be useless. It had enough internal friction damping to twist the thinnest extension rod of the monopod. This would cause slight glitches in the panning action, which ruined the smoothness of the pan. To fix it, I inserted thin washers in the mounting screws of the ball joint footplate, enabling the ball joint to rotate freely instead of the fluid-damped cartridge.